Springtime is peak season for some animals that seek shelter in homes, swamping animal removal services with calls about rodents and possums. KNOXVILLE, Tenn. — It is springtime and many wild animals are active again. Just ask the Harriman Police Department. The HPD posted several pictures on Facebook of a rescued brood of orphaned possums. The police ultimately found the creatures a new home with the wife of a TWRA officer. 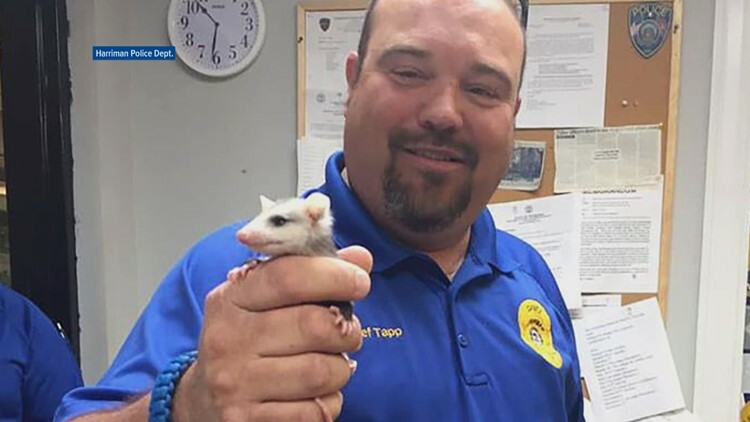 Photo posted to Facebook by the Harriman Police Department of Chief Tapp holding a young rescued possum. This time of year, you might find critters trying to live in your home. Spring tends to swamp animal removal services with calls about wild uninvited roommates. 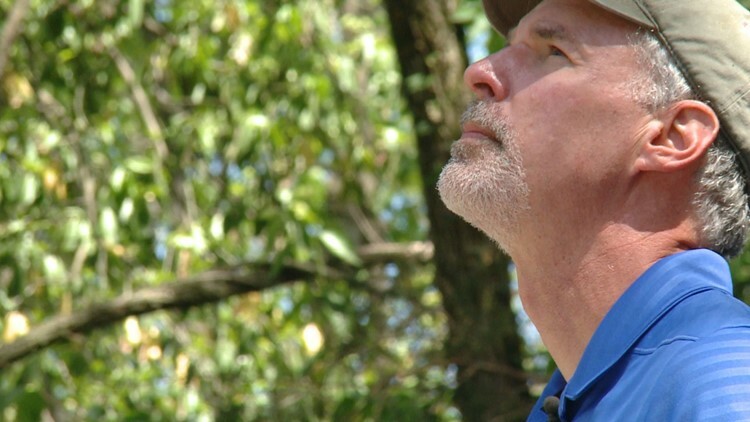 Of the plethora of pests that pique zoologist Paul Osborne's interest, Wednesday afternoon it was a pesky possum in North Knoxville. "I got a call about a possum inside a house. A woman woke up with a possum in her bedroom. So, I'm just going around this house and doing an inspection," said Paul Osborne, owner of All Creatures Wildlife Services. Osborne says this time of spring is peak season for calls to remove rodents and other pests. Paul Osborne of All Creatures Wildlife Services finds possum prints in the cellar of a home in North Knoxville. "Rodents have peaks in April and then again in October. We're dealing with lots of squirrels, groundhogs, chipmunks, rats, and mice. We're right on the edge of snake season. When the rodents get active, snakes are going to start feeding and get excited, too," said Osborne. As for the opossum, the animals do not pose much of a threat aside from a pungent odor. The possum's body temperature is too low to carry rabies and many other diseases. Any menacing appearance is usually nothing more than posturing. "You never hear of anyone being attacked by a possum. They look horrible. They smell bad. They drool. They growl. It's all looks and smell. They just want to be left alone," said Osborne. "But you never want them inside your house. Along with the terrible odor, they can carry fleas and ticks. Sometimes people will have a flea infestation and be confused because their pets have been treated. Then they will find out there is a possum somewhere in their home." 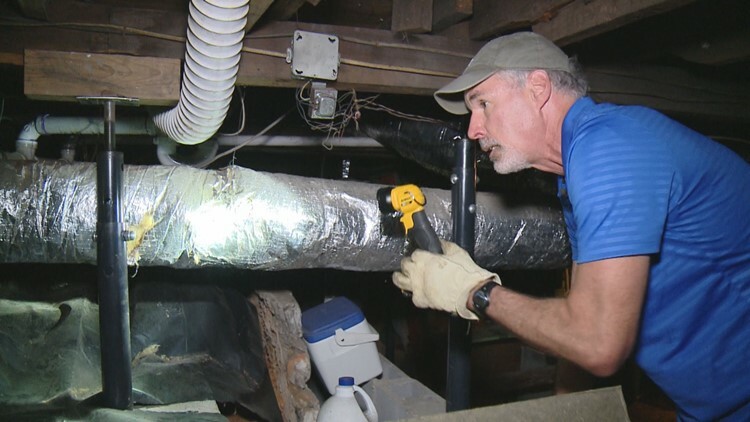 Paul Osborne, zoologist and owner of All Creatures Wildlife Services, inspects a home in North Knoxville. Osborne says now's the time to protect the perimeter of your home. "Check your house for any kind of cracks, gaps, and openings. Even soft spots, because animals can chew or tear away to make an opening. They're like us. They're going to choose the easiest way in," said Osborne. As for the bedroom-invading possum, all signs point to the animal entering through the cellar. "We have fresh markings, claw marks, and sure enough there's a two-inch gap under the door to the cellar of this older home," said Osborne. "We see paw prints in the dust [in the cellar]. These are possum prints, what looks to be an adult. She's probably got her babies on her back and this baby just got knocked off and somehow made its way to the bedroom." Osborne said there was no way to quickly find the animal with so many places to hide in the cellar. He set traps to capture and relocate the critters. "What I'm going to do is just back off and set traps for her. I'll try to get her and her brood out and to a wildlife sanctuary," said Osborne. "Of course, they want shelter just as much as we do."